them even more paradise for a price, guaranteeing them his prices are “same, same” as the other guys. On my recent trip there, the only place that didn’t happen was in Ha Thanon, a name people don’t seem to use when mentioning it. They just call it the Muslim Village around the island. Since I’ve been living amongst Muslim villages half my life without ever thinking of them as such and since I don’t think about Thailand beach resorts and Islam together, it was a place I felt drawn to, even thought I’m not sure the cab driver understood why. I don’t think he takes many tourists there. You can smell the fish drying in the sun long before you hit Ha Thanon’s narrow, dusty pathway. This is one of Koh Samui’s main fishing villages, and it is lined with metal racks filled crowded with gutted fish drying from the early morning catch. But before you get into the heart of the village, its massive market welcomes you with a plethora of fish and fruits and vegetables alien to both my Western and Middle Eastern eyes. This isn’t a tourist destination and so no one had anything to sell us but produce, which they could tell we didn’t even recognize, and so they had no interest in us. Nearly all the vendors were women, slightly less than half wearing some form of the hijab. Their children ran amongst the stands, escorted by flies and mosquitoes, and they had absolutely no interest in us. I tried to engage one of the women kneading a black ball into little pellets by asking what the black stuff was, but there was no English to be found anywhere, and I think I made her nervous. I wondered if a ‘salam aalakum’ might have given us a Muslim sisterhood to work with, but I hadn’t heard the greeting once since being there so I passed. We walked on, avoiding the young covered women plowing by on their mini bikes, past the teak wood trimmed homes, all very humble, mostly run down, with chickens and caged birds eyeing the fish racks, and people laying on cushions hiding from the noon heat and steam. Cushions seemed to be the only furnishing in the dark homes, and the only items that looked remotely new and in good condition in any of them were the TVs. 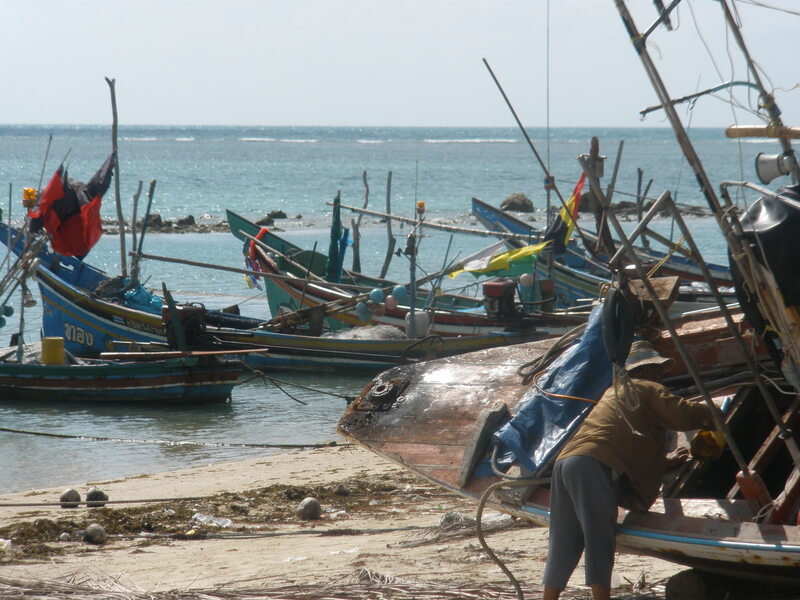 As we went on, the smell of the fish got stronger until we reached the fishing boats, brightly painted in red and blue stripes that are the village’s trademark. (I was later told the boat design came with them 120 years ago, when they settled here from somewhere off the coast of Malaysia). The fishermen were clearly done for the day, lounging and laughing about something around a Pepsi carton. And then at the end of the village, we came upon the newest spot in town—the mosque, which I’m guessing was paid for by someone outside of the village. I would have gone in and asked more about if I had a headscarf, or perhaps more importantly, if I could speak Thai. 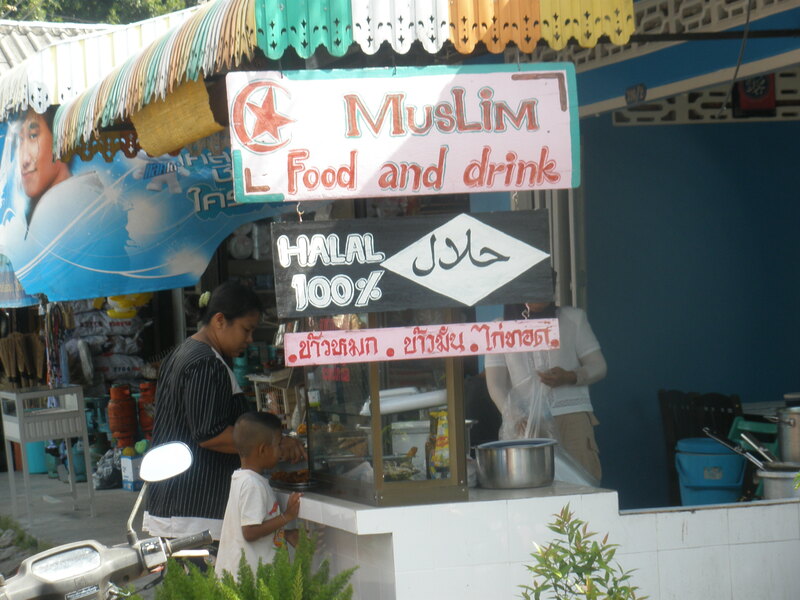 As we made our way back out, we came across a couple of hole-in-the-wall restaurants with signs bearing the only non-Thai writing in the village, signs in Arabic and English letting us know halal food is served inside. I guess they must get passersby going to the mosque every now and then. No doubt, it was halal, but I had no idea what it was. Halal is not a cuisine but a practice, and the cuisine of this village was not the kind I recognized from any other village where the population was predominately Muslim. But in this village, we may have not only seen Islam outside the Middle East, but the real Thailand, so hard to find for all the tourism so necessary to keep most of the people on these islands housed and with food, halal or otherwise. “Silence” is a relative word, referring to how quiet a place is compared to other times. Silence in a home still involves the hum of the fridge, the heater, the creaking in the wood, the wind on the windows, and so many other things. Outside, it means the birds still chirping, bugs buzzing, the breeze, a car going by on a distant highway. But nature showed my brother and I definite silence when I took him to Liwa on his short visit to Abu Dhabi. Liwa is the center of the Empty Quarter, Liwa being the oasis in an the unforgiving terrain of spectacular tawny sand swirls going up and down dunes in what I’ve been told is the world’s largest sand desert. It was just after a holiday, and so no one was traveling–the usual dune hiking was absent as we drove to the most famous and tallest of the dunes. Merheb Dune is sadly surrounded by concession stands and race tracks that minimize its beauty. So we went back and stopped at a spot with no duning tracks. 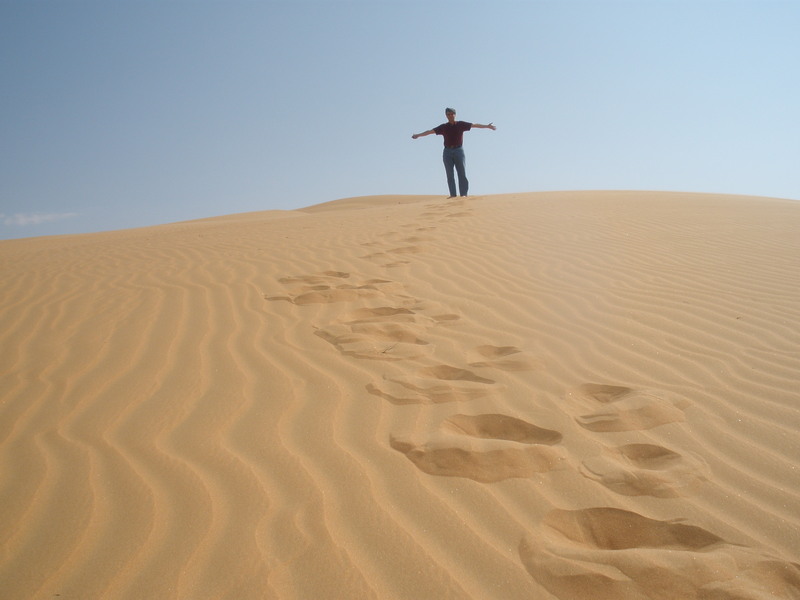 Like I have done for everyone that has come to visit, I wanted my brother to experience the sensation of running up and down a dune, your feet sinking into pockets of hot and cool softness as the sun creates patterns on it. At the top of one dune, we stopped so he could take a picture. And that’s when the silence got to us. We hadn’t grown up with even the pretension of silence inside or outside out home, and as adult both our worlds were noisy, his with rockets and children and mine with a long list of big cities. I don’t think we’d ever heard total silence: not an insect or bird, not a trace of wind, no human noise except the noise that is always in our heads, and even that seemed to quiet down. “What is that?” I asked. “Silence,” he shrugged. “Kind of freaky, huh,” I answered. “Cool, too,” he said. Silence as golden as the sand literally was. We kept waiting for something in nature to make a sound, but nothing did. I don’t know if there is anywhere else to experience absolute silence. That’s why I was a little saddened the other day to hear about new plans Abu Dhabi has to build several resorts in the area and expand the population over the next few years by 350,000. Perhaps it will help the Bedouins of the area have a better life, but maybe there is an easier way to give them that chance, a quieter way, a way that will not defy the reasons it has been called the Empty Quarter for so long.